It's interesting how things work out sometimes. As I enter the last week of summer, I closed the book last night on my search for the Karate Kid Hot Wheels car but have still come up empty all summer when searching for a can of the elusive Sriracha Pringles. After dropping Charlotte off at school this morning, I decided to run a few errands including one last search for the supposedly-exclusive-to-Wal-Mart Pringles. Wouldn't you know it? Jackpot. I also stopped at Lowe's with grand ideas of completing some projects around the house and yard today. Everything I had planned was sidetracked when I finally reached my boiling point with our lawnmower. After almost three years of having to clean the spark plug every time I mow the yard in order to keep the thing running, I'd had enough. Actually, I didn't have much choice since the lawnmower had come to the point where it would only run for about 60 seconds at a time. I contemplated the purchase of a new mower but decided to take the thing apart first and see what I could come up with. Now keep in mind that I know nothing about small engines. I don't really know anything about large engines either. After two hours, a few YouTube videos, a call to my dad, and a little bit of super glue and duct tape, I'm happy to say that our lawnmower is running better than it has in years. As I've said before, you can now rest easy FASTE readers. I know you were concerned about our mower. Not familiar with classic Eazy-E lyrics or old video game systems? That's fine. 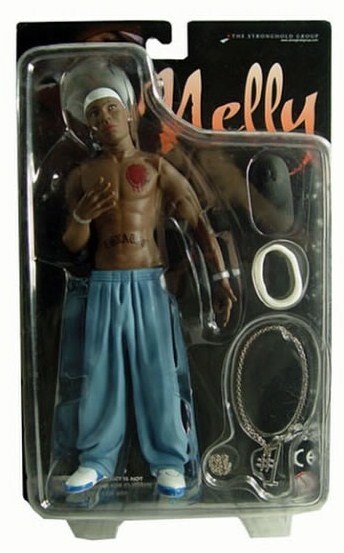 How about a Nelly action figure instead? Last but not least, my birthday is coming up in a little over eleven months. Please start your search now for my present. Thanks in advance. The internet has allowed me to install a dishwasher, replace a hard-wired fuse in said dishwasher, and replace a solenoid in my fridge door for the water dispenser. All in the last year. And I have very little technical expertise. The internet can be very empowering at times.